Hard Rock FM pronounces itself as a lifestyle and entertainment station, years before other radio stations start following its footstep. 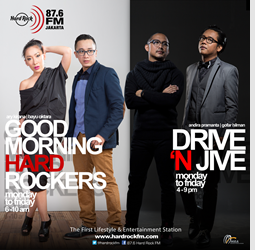 Of course, as the first of its kind, Hard Rock FM is always ahead on featuring the latest trends. It can be fashion news, sports news, gossips around icons and celebrities, also hot issues around the city. Do not be fooled by the name Hard Rock, because the music is not only hard rock, but many kinds. Hard Rock FM is pop - alternative - jazz - techno - progressive. Hard Rock FM is everything ! Hardrockers (Hard Rock FM listeners - Red) are male and female at the age of 20-30 years old (Jakarta, Surabaya), 20-35 years old (Bandung), 17-35 years old (Bali) with social economic status of A, B. Hardrockers are the type of people who has balance importance among other people, current enjoyment and also place high importance in terms of progress in life, pride of success, self-worth, pleasure seeking, like to socialize, self confident, adaptable towards change, impulsive. Listen to Hard Rock FM in these cities: 87.6 Hard Rock FM Jakarta, 87.7 Hard Rock FM Bandung, 89.7 Hard Rock FM Surabaya, and 87.8 Hard Rock Radio Bali. In order to keep up with technology and the speed of information, Hard Rock FM Jakarta is now transmitting its program to Bandung for its regular time hours.